The Year of Living Fabulously: I Love Perks! My wonderful job had a dinner meeting that we got paid to attend. So nice!! The dress code was casual but since I work for a fashon college it doesn't mean "going to the store and not caring who sees you" casual. I chose to go with a trend that has been around for some time and is hanging on for dear life: Military. 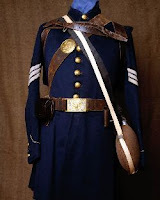 The kind of military style popular now is more vintage, like Civil War through WWI. 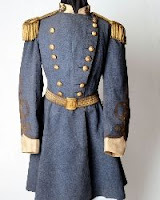 It's mostly identifiable by the buttons and band collar. 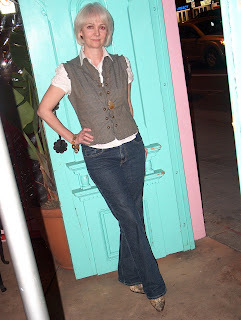 I wore a plaid vest that has a band collar and some cool military-like hardware. It has a bit of small ruffling on the armseye and yoke which makes it more feminine. Another trend right now is mixing opposites so if you want to do military and be super "now" you could put it with something soft and innocent or bohemian. 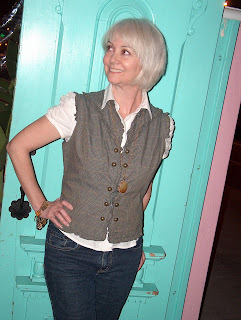 I chose a shirt with puffy sleeves and a 1950's charm bracelet which echoed the copper in the vest buttons and, in a way, resembles medals. And thanks to Devesa for taking the pic. Adorable...once again. I'm really enjoying all the fashion facts you have been sharing. It's interesting and informative. Thanks.